Hackney is developing a name for being a centre of designer outlet stores. It’s certainly a lot closer than Bicester Village. There’s also quite a few railway arches leading towards Hackney Central/Hackney Downs station complex, which could make a whole lot more designer outlets or fashion workshops. But at least the Council has its finger on the pulse and are consulting about what to do with the area. Let’s hope they get it right! Southgate Road is just round the corner from where I live and it forms the boundary between the posh of Islington in the West and the plebs of Hackney in the East. Over the last couple of weeks, the traffic lights, where Southgate Road and Balls Pond Road cross have been replaced and we now have Countdown, which makes crossing easier. Now Islington want to put a box junction just to the South of the traffic lights, where Dove Road joins Southgate Road. These pictures show the area. I have a feeling that this scheme may be a little bit half-baked, as it appears to be an Islington-only scheme, when surely, it should be a scheme that is promoted by both Boroughs. Last week, I went to a consultation about the Draft Hackney Central And Surrounds Masterplan in the Narrow Way by HackneyCentral station. If you want to see the full version of the masterplan it is available at www.hackney.gov.uk/spd. As this article will be sent to the Council Planning Department, I’ll say a little bit about myself. Widowed, in my seventieth year and living alone. I’m coeliac, which I inherited from my father. I always describe my politics as left-wing Tory and very radical. As someone, who has helped create two high class technology businesses sold for millions of pounds, I’m very entrepreneurial. My father and three of my grandparents were all born within the triangle based on the Angel, Dalston Junction and Highbury Corner. My father was the least racist person, I’ve ever met. I hope his attitude has rubbed off on me! My two grandfathers were of part-Jewish and part-Huguenot ancestry respectively. As my two grandmothers families came from Northants and Devon, I usually describe myself as a London mongrel. My late wife and myself partly brought our three sons up in the Barbican. My middle son talks of that time in a tower block with affection, so I’m not against well-designed tower blocks. After a stroke, left me unable to drive, I returned to my roots. I like lots of things about it. And especially these! The prominence given to new workspace, shops and the creation of jobs. The creation of new housing, where I’m only against bad tower blocks. The opening up of the railway viaduct, so it becomes a feature. Network Rail get a lot of stick, but they know how to look after railway brickwork. The creation of a public square at the bottom of the Narrow Way. The creation of more pedestrian streets. Better use of the bus garage site. It wouldn’t be me, to not put in my own wish list. Truth be told, I don’t think Transport for London, thought the Overground would be the success, it has turned out to be. So the designers did the minimum they felt they could get away with and would satisfy their political masters! But the London Overground’s success has been repeated in places like the Borders Railway, Electrification in Liverpool, new stations in Leeds and the Todmorden Curve, and it is now proven in the UK, that if you give the population a good train service, they’ll use it. Now that the walkway has connected Hackney Central and Hackney Downs stations and other improvements to the complex are in the pipeline, I think that serious consideration should be given to creating a second entrance to Hackney Central from Graham Road. Failing that, pedestrian routes should be improved, so that access to the cluster of buildings around the Town Hall and the Empire is easier. Once the public square is created at the bottom of the Narrow Way, use of the area as a meeting point should be encouraged. Hackney Central is where two rail lines cross. The London Overground through Hackney Downs gets new trains in 2018. There are several bus routes passing through the area. Bohemia Place and the railway arches must have potential for specialist shops and cafe/restaurants like Leon. Leon was started by a Hackney resident. Who said it’s all about location? I travel extensively, in the UK and Europe and see both good and bad examples of how to develop cities and towns. Recently, I went to Blackburn and I was totally surprised at the transformation since I last visited a few years ago. A Landscaped square had been created between the station and the cathedral.The square is surrounded by a PremierInn, a new office block, a small bus station on one side and a pedestrian way to a supermarket on the other. Hackney could do similar or even better. My uncle was a very good sculptor and I feel it is a crime that works of art like large bronzes are kept in store because security and insurance is a problem. However, there are places where they could be placed with little fear of theft or damage. And that is at carefully selected locations on the platforms of railway stations. 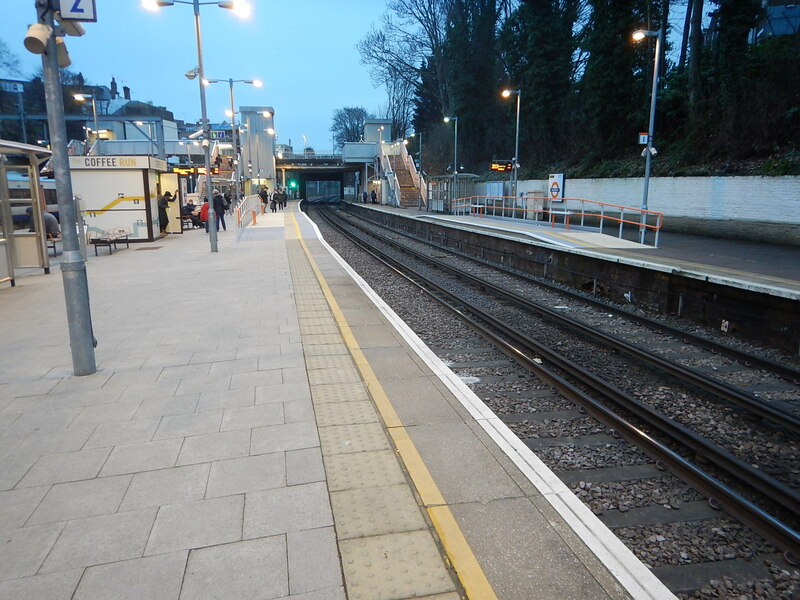 Hackney Downs certainly has space for one, but the platforms at Central are too narrow! When I was on holiday in Iceland, every building with a historic connection, had full information displayed outside. Is Hackney’s information up to scratch? This is a series of pictures with comments. Hackney Central has some interesting buildings on which to develop the area. Unfortunately, there is some bad examples of boring architecture. Some sites definitely have potential. 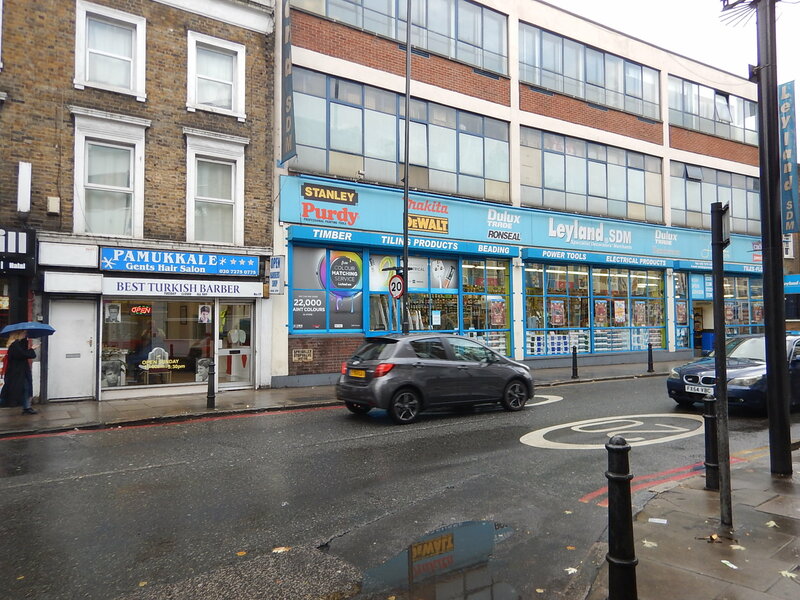 Could the top floors of the Iceland building, be converted into a Southern station entrance, with perhaps a cafe and a couple of shops that travellers like? Bohemia Place could be a nice oasis with cafes, workshops and individual shops, a bit like the Box Park at Shoreditch High Street station. Bohemia Place will be better, when the arches under the railway are opened up. The right architect could do a fine job on the M & S Building. The car park at Hackney Central station might be much better as a bus interchange. In my view the key is Bohemia Place, as this could be a magnet for people of all ages, races and classes to come and shop and refresh themselves. How Could The Twenty Mile Per Hour Limit Be More Strongly Enforced? Where I live in Hackney, in common with some other London boroughs, there is a lot of twenty mile per hour zones. As the picture shows they are well signed. But this doesn’t stop drivers and motorcyclists rushing around, often quite a lot in excess of the allowed limit! Councils have been criticised recently over using box junction cameras as cash machines, as this article on the BBC details. The title of London councils raise millions through box junction fines summarises the article well! It may be an erroneous observation on my part, but as London gets more congested and the traffic slower in Central London, it does seem that when the traffic eases as it often does in Hackney, that drivers take more than a legal advantage. Excessive speed also seems to have got worse in this area, since the 20 mph limit was brought in. Red rags and bulls come to mind. Why can’t we set up a network of automatic number plate recognition cameras, that locate and timestamp vehicles in the 20 mph zones. Computers would then check all the timings and issue tickets to those, who obviously got from A to B at over the speed limit. Just like cameras on motorways around road works. It could be a very nice little earner for councils. Surely The Labour Party Can Do Better Than This! Just voted in the Hackney Mayor election. What is the Labour Party’s logo? It doesn’t reproduce well in black and white on a ballot paper. It looked like a cartoon version of Mr. Punch. There was no difficulty with the others, especially the One Love Party, who had a heart! Incidentally, the candidate for the One Love Party was French and their web site was a .eu one! She’d probably have got nul votes in some parts of the UK. 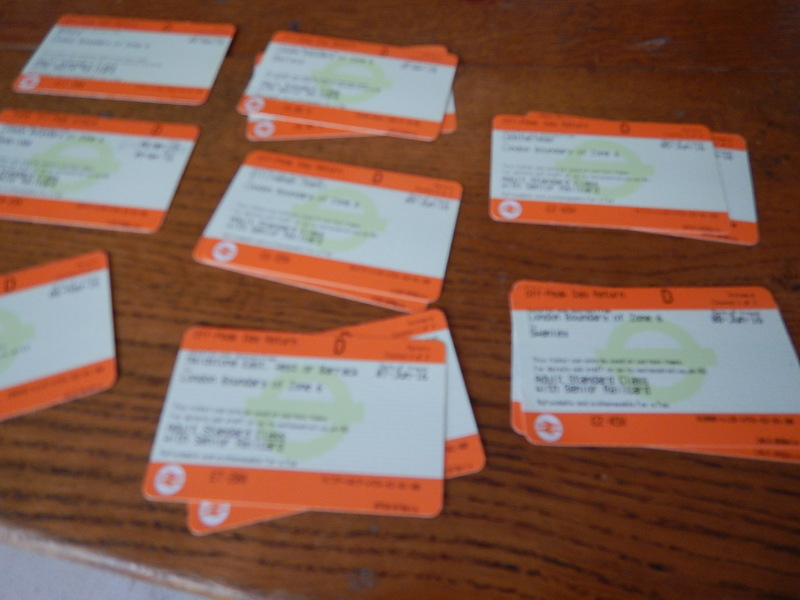 I had a tidy up this morning and found a lot of orange rail tickets. These tickets are some Singles, but mainly Returns to places on the fringes of London. Some of these journeys may seem better value than you can get. But then as I live in London and have a Freedom Pass, which gives me free travel to the Zone 6 Boundary of London’s travel system, so I’m buying a ticket from that boundary to my destination, which I then buy with a discount, as I have a Senior Railcard. I also live close to Dalston Junction station, which is one of an increasing number of stations, where you can purchase a ticket from the Zone 6 boundary to a large number of stations, in a ring around London, in a ticket machine without resource to either the Internet or a Ticket Office. What would be better, would be able to associate a bank card with my Freedom Pass and Senior Railcard. So if I used the bank card as a ticket, like millions do across London every day, it would deduct the cost of my travel to the Zone 6 boundary, that I get free with my Freedom Pass, and then charge me accordingly. An Estate Agent, who I meet on the street by my house and with whom I often have a quick chat, believes that inward migration of older people into London is driven by the following factors. Availability of quality housing, that is comparable in price to a large residence in a good location in the countryside. Lots of free museums and galleries. Lots of paid for events, culture and attractions. The ability to live without a car. The last time we met, he told me how he’d just sold a French couple a quality two-bedroom house round the corner to help get round some of France’s tax and inheritance rules. Who’d have thought that London would be a place where people retire? But then since about 2000, my late wife, C and myself had planned to sell-up in Suffolk at some time and move to somewhere like Hampstead. Sadly, she didn’t make it, so I came by myself to the more edgy and plebian Hackney. But I don’t regret the change of location one iota. Where will I explore today? When I wrote Walking From Haggerston Station To Mare Street, I hadn’t realised how the scheme to effectively convert Middleton Road into a car-free route, would affect De Beauvoir Town. 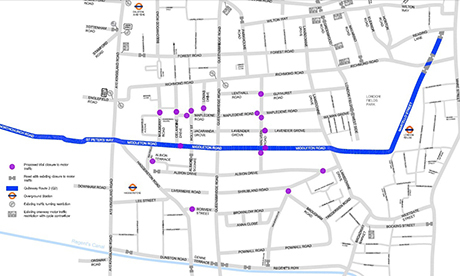 Look at this Google Map, which shows the car-free route across London Fields. The map is rather vague about what happens when it crosses the Kingsland Road and all it shows is a wavy line, which if you enlarge it and use a magnifying glass, has something like Northchurch Road written on it. This Google Map shows the area from Southgate to Kingsland Roads. I think as Middleton Road links up to the South Side of De Beauvoir Square, that the downward kink in the route is De Beauvoir Square, so the route goes past St.Peter’s Church and then up Northchurch Road. For the first part of Northchurch Road, the route is following the route of the Cycle Superhighway CS1, that goes up Culford Road. The two cycling routes are marked in blue on the map. If the traffic scheme in London Fields is made permanent, I think I will be pleased, as it would give me a car-free cycle route from my house to the Cultural Quarter of Hackney. If there were Boris Bike stations in De Beauvoir and London Fields, I wouldn’t even have to buy a bike. On the other hand the London Fields scheme could generate a lot of cycling traffic through De Beauvoir Town. Others might not be so pleased! I did this walk as the area from East of Haggerston Road through London Fields is going to be traffic calmed, as described in this page on the Hackney Council website. This report in the Hackney Citizen is entitled London Fields residents clash over car-cutting measures. This is said. Residents are at loggerheads over council proposals for a car-free zone to the west of London Fields. During the three-month trial period, due to begin in January, Middleton Road and surrounding streets will be blocked off to motorists, allowing cyclists and pedestrians to travel freely down Middleton Road. Residents will still be permitted motor access to all streets. Nothing is as difficult as getting the correct mix of traffic. They also provided this map. So I took a lot of pictures as I walked. It was a charming walk, through fairly wide streets with lots of trees. Hackney is no crime-ridden wasteland! There was no sign of any traffic calming. The area has a high level of cycling. I suppose being flat helps. There were a few cases of traffic rushing about. Stonebridge Gardens is being upgraded with a new design. I remember the area from the 1970s, when C ran a short life house for ex-prisoners, just off Mare Street. You could say the area has improved, without too much drastic change. This Google Map shows the area, where I walked. Haggerston station is on the East London Line at the West (left) and London Fields station on the Lea Valley Line is to the right of the green space that is London Fields, with its fifty metre heated outdoor pool. Mare Street is the A107 running down the map to the right of the railway. I live just a few hundred metres from the top left corner of the map. It will be interesting to repeat this walk, when the traffic calming is complete and they’ve finished painting the bridge. 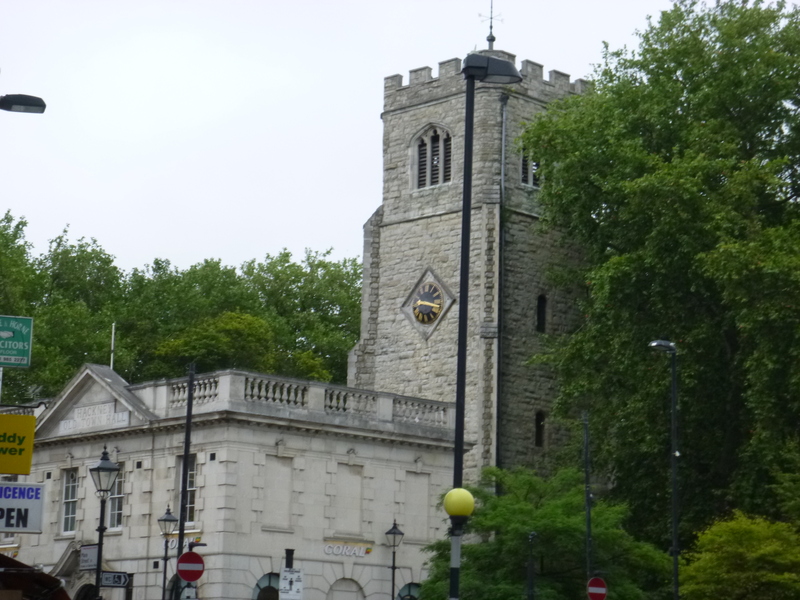 Corals Betting Shop in Hackney has an interesting juxta-position with St.Augustine’s Tower. The tower and its contents are Grade 1 Listed.